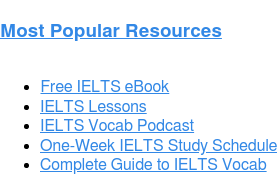 Home › IELTS Resources › IELTS Podcasts › IELTS Podcast (Ep. 18) | What is a Good IELTS Band Score? And don’t forget to check out these helpful resources! Welcome to the Magoosh IELTS Podcast! This is Episode 18. In this episode, you’re going to learn all about IELTS band scores, including how the scores are calculated, and what’s considered a “good” score in different parts of the world. First Eliot and I will discuss what the different band scores mean, and then we’ll talk a little more about what IELTS score you should aim for depending on what your academic and professional goals are. 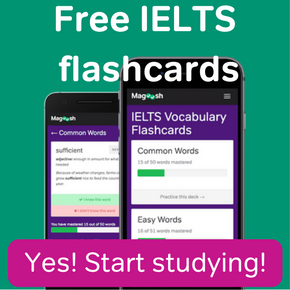 Don’t forget to visit us at IELTS.Magoosh.com for more great resources to improve your IELTS band score. 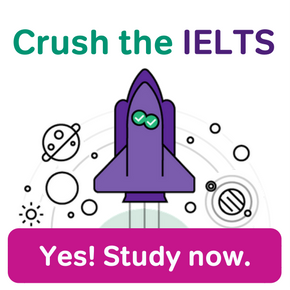 Use coupon code “ieltspodcast” to save 20% off your IELTS test prep. Naomi: Today we’re going to talk about different scores you can get on the IELTS, and what those scores mean. Eliot: When you take the IELTS, you will be given a score between 1 and 9 on each section of the test–as well as on the test as a whole. Naomi: So let’s start from the top. Eliot, can you tell our listeners what a 9 on the IELTS means? How are these scores calculated? Eliot: Well it varies a little from section to section (you can find rubrics for the IELTS Speaking and Writing sections on our website–we’ll put a link in the show notes), but in general, scoring 9 on the IELTS means that you are completely fluent in English. You understand everything and you don’t really make mistakes. You’re an English expert! Naomi: What about an 8? Is that pretty similar to a 9? Eliot: An 8 is very close to a 9–it means you’re basically fluent, but you might make a few mistakes, in especially tricky or unfamiliar situations. Maybe you’re not an “expert”–but you’re very, very good at English! Naomi: Okay, I’ll take 7. A score of 7 on the IELTS means that you’re good at English, but you do make mistakes sometimes. The difference between a 7 and an 8 would be that 8s really only make mistakes in extremely difficult situations. Eliot: A score of 6 means you’re a “competent” English user. You know English well enough to navigate some fairly complex language, and even though you make some mistakes, you generally know your way around the language–and you definitely know the basics. Naomi: A band score of 5 means you’re a “modest” English user. You definitely make mistakes, but you’re still able to understand overall meaning in most situations, especially ones that you’re familiar with. Eliot: If you score a 4, you would be considered a “limited” English user. You can really only understand basic English in familiar situations, and beyond that you have problems understanding or expressing yourself. Naomi: A 3 means you’re an extremely limited English user. You can only understand and communicate small amounts in very basic situations. Eliot: If you score a 2, this means you had a very difficult time understanding or communicating much at all. Naomi: And a 1 means you had no ability to use or understand English except for a few words here and there. Eliot: You can also get a 0 if you don’t answer any questions at all, but we figure if you’re putting in the time to listen to this podcast, that’s definitely not going to happen. Naomi: Okay, so now that we know what each score means, what scores should students aim for? Eliot: Well, it really depends on what school or program they’re applying for. Most universities or governments will have their IELTS score requirements published online, but to give you an idea of what most schools are looking for, we’re going to take you on a quick tour of some of the IELTS score expectations of schools around the world. Naomi: If you’re hoping to attend school in Australia, most of the larger universities (like the University of Sydney, the University of Adelaide, and the University of Melbourne) recommend an IELTS score of 7, but will accept scores as low as 5.5 for some programs. Eliot: University of Alberta and Queen’s University in Canada require an undergraduate score of at least 6, and a graduate score of 7. Naomi: In the UK, many of the easier programs require just a 6, with at least a 5.5 on any individual IELTS section. Eliot: But if you want to go somewhere more competitive, like Oxford, you’re going to need at least a 7…and a 7.5 would make you more competitive. Naomi: Before we find out some other IELTS score requirements, let’s pause for a word from Magoosh. Are you ready to improve your score and get into your dream program? Great! We’re ready to help. 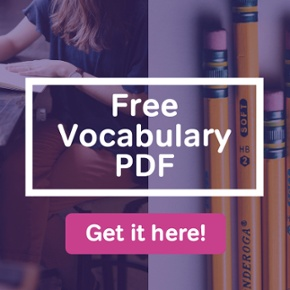 Visit us at ielts.magoosh.com and use coupon code “ieltspodcast” to save 20% off your IELTS test prep. Naomi: So Eliot, what’s a good IELTS score for students who want to attend university in the United States? Eliot: The U.S. government is one of the only governments without a minimum IELTS requirement, but U.S. universities tend to have higher score requirements than many other parts of the world. In general, you’ll want at least a 7–although a 6 or 6.5 will still allow you to qualify for many U.S. schools. The takeaway here is that if you’re applying to a competitive school anywhere in the world, you’ll probably want to aim for an IELTS score of 7…but if you’re not applying to one of the top universities, you’d be safe with a 6 or occasionally even a 5. Naomi: So, Eliot, what if someone didn’t get the score they were hoping for? Do you have any tips for improving your IELTS score? Eliot: Absolutely! If your IELTS score isn’t high enough, your first option is to resit the test–ideally after a little more studying. But retaking the test isn’t your only option. You can also talk to the university you applied to, and see if they’re still willing to admit you with below average scores. School admissions are sometimes willing to be flexible, especially if you have a strong professional or academic background. Naomi: That’s a good point. You could also consider applying to a different school that has slightly lower IELTS requirements, right? Eliot: Yes that’s an option. Plus if you don’t want to retake the IELTS, you might want to think about trying the TOEFL. While there’s no clear answer to which test is “easier”, some people have better luck with one test over the other, so it could be worth giving the TOEFL a shot. If you’re taking the IELTS in order to get a visa, check to see if there’s a different class of visa you can apply for, that doesn’t require as high of an IELTS score. Naomi: These all sound like good options…but if you tested at a 5 you probably won’t be a good candidate for most universities, and at a 4 or below it will be difficult to get a visa at all. So how can people improve their IELTS scores? Eliot: Well, here are a few suggestions. If you want a better score, you should practice your English as much as possible. Read English websites, magazines, and books. Watch English TV shows. Talk to other people in English as much as you can. This will really make a big difference in how you do on the test. You can also learn more about the test itself. Make sure you know everything you can about the IELTS: the timing, the format, the types of passages, audio tracks that’ll be on there–everything. This way you can get over any nerves you have, and you won’t be as stressed on test day. Naomi: What about getting feedback on your writing and speaking from someone who knows English, such as a classmate, teacher, or friend? Eliot: Yes that’s a great suggestion. Just make sure it’s someone whose judgement you can trust. You should also try to find good vocabulary word lists, and practice using your English vocab in context. Just knowing the definitions of words won’t be enough for you to get the score you want on the IELTS; you’ll have to know how and when to use them. Naomi: And don’t forget to take care of yourself on test day! More often than not, if a student gets a lower score than they were expecting, the reasons are physical. Maybe they were too tired, or they got hungry and lightheaded during the exam. Or maybe they were sick. Make sure this doesn’t happen to you by resting well and eating well the day before the test, and on the morning of. Being healthy, alert, and calm during your IELTS exam will make a huge difference! Eliot: Definitely. So the takeaway here is that a good IELTS score varies depending on what school or program you’re applying to, but if you have at least a 7, you’re in good shape. 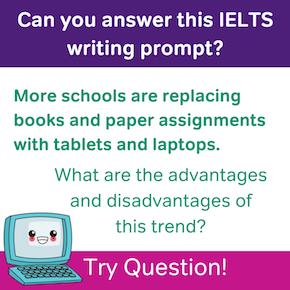 Naomi: And if you score a 5 or lower, you’ll want to retake the test or consider some other options–but don’t stress too much, there are lots of ways you can improve your IELTS score. So what did you think? If you need more practice, check out the show notes for a transcript of this episode and links to the resources we mentioned. Oh and by the way! We’re still looking for volunteers to help us translate our show transcripts from English to your first language. If you are interested, please email me at naomi@magoosh.com with the subject line “translation,” and let me know what language you can translate into! Thanks for listening! If you like our show, help us out by leaving a rating and review in Apple Podcasts, or wherever you listen–this helps people find us! And don’t forget to hit the subscribe button. Until next time! This is Naomi at Magoosh, wishing you happy studying! One Response to IELTS Podcast (Ep. 18) | What is a Good IELTS Band Score?